Home / Blog / Foster Care Adoption / Infographic | What happens when kids age out of foster care? Older youth are often overlooked because we, as a society, believe they don’t need a family. We have convinced ourselves that these kids have made it on their own for this long, they should be able to make it as adults as well. It’s true, these kids have been without a permanent family for a long time—kids who reach 18 in foster care have typically been in the system for over three years.1 But, we forget the ways families often help their 18-year-old kids do the things they need to do to become adults: apply for college and jobs, learn how to drive, navigate complicated relationships, etc. The statistics are dire. More than 23,000 kids age out of U.S. foster care each year.1 Without the support that comes from an adoptive family or permanency connection, these kids face really tough odds. Many will end up with chemical dependencies, criminal records, or pregnancies at a young age. Few will graduate college. You can help. There are a number of teens waiting for adoption each year. In Minnesota alone, there are 320 kids ages 12-18 waiting for adoption.2 We need families to open their minds, hearts and homes to these children. We also need advocates to help spread the word about who they are, and to open up the conversation with their friends and family about why it’s important to consider adopting teens. Won’t you help? In the coming month, we will be sharing posts about teens who are at risk of aging out. Please contact us to learn more about them, and share their stories with your friends and family or this infographic. Together, hopefully, we can change their futures. 1. 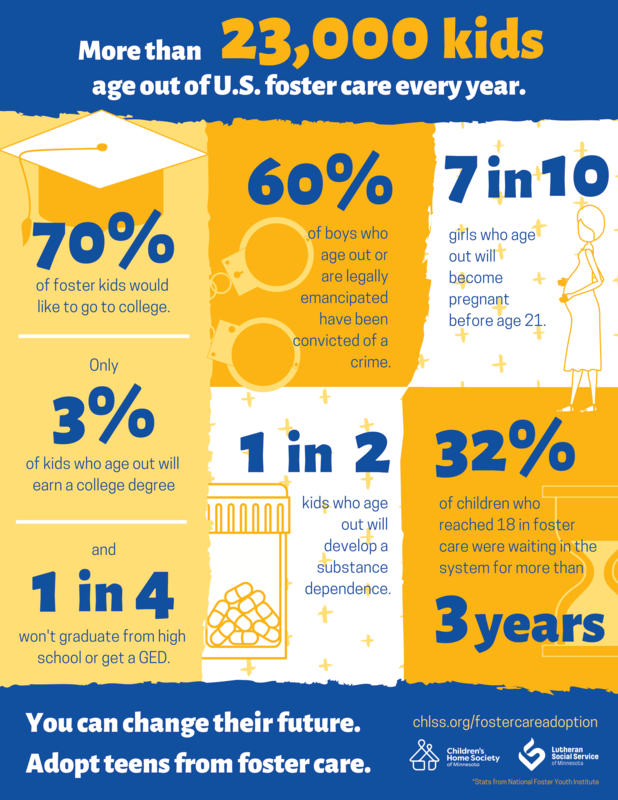 National Foster Youth Institute; all of the statistics in the infographic are also from this source.